Ironing large piles of laundry is a time-consuming task that is almost as tedious as washing dishes. But there is a way to make life a little easier and it’s called a steam generator. This writer’s scoured the web and called in an assemblage of these handy steam-billowing household helpers and put them to the test using more crumpled shirts, jeans and large unwieldy duvet covers than I care to remember. You can either read on for the results or take it from me that both the Philips PerfectCare Compact and Philips PerfectCare Elite are the best you can get without spending an eye-watering amount of money. What's that, you want to spend an eye-watering amount of money? In that case, their pricier sibling, the Philips PerfectCare Elite Plus is absolutely stellar. What is a steam generator, then? Steam is a crease’s arch adversary, so it stands to reason that the more steam you have at your fingertips the easier the task. Steam generators work in the same way as bog standard irons, only they’re a lot more powerful and therefore faster, easier and more efficient for ironing large amounts of laundry. Unlike a standard iron, a steam generator is comprised of a unit containing a water reservoir, boiler and pump that connects to a lightweight iron via a length of rubber hosing. This separation of components allows steam generators to produce far greater volumes of continuous high-pressure steam and, in most cases, stupendously powerful steam boosts for tricky fabrics and heavy creases. For instance, where a common or garden iron kicks out around 55 grams per minute of continuous steam, a good steam generator is capable of discharging between 120g/min and a whopping 165g/min. You can also use the iron unit vertically for steaming curtains and suits. However, steam generators do have a number of disadvantages. They’re more expensive than irons, they take up to three minutes to warm up, and their base units are quite heavy and bulky and ideally need to be used on a steam generator-specific ironing board (Brabantia produces an excellent range of sturdy models). They also tend to make a loud-ish buzzing noise while the steam is being pumped from the main unit to the iron. However, if you regularly deal with a lot of laundry, a steam generator will certainly make life much easier. Obviously, if you only iron shirts for weddings and funerals, they could be slight overkill. 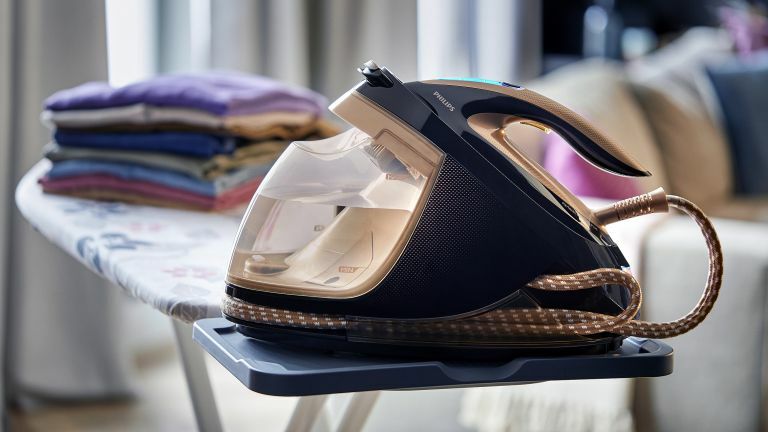 A T3 feature guide with one company hogging four spots is a rarity outside of the drone market, but the simple truth of the matter is that, right now, Philips is producing far and away the best irons and steam generators on the market. We’ve already thrown accolades at three other Philips steam generator models in this roundup but – hold your horses – here comes that fourth. And it’s shot straight to the number one spot. This keenly priced Compact model differs in a few areas from its pricier and higher specced stablemates, but it’s almost as efficient and, in many ways, much more practical for day-to-day ironing duties. Despite being the same size, the hand unit is slightly heavier than the others (1.2kg as opposed to around 0.8kg) but not ungainly so. Also, the non-detachable reservoir holds 1.5-litres of water instead of 1.8-litres and both the continuous steam and boost outputs are somewhat lower but still more than capable enough for the job in hand. Crucially, the whole package is small enough to sit on an average ironing board cradle – something you can’t confidently do with other steam generators. As is the case with the majority of Philips steam generators and irons, this model also comes with OptimalTemp technology which uses just one temperature setting for all types of fabric, whether it’s heavy denim or fine silk. The system is so perfectly dialled that you can safely leave the iron unit face down on the ironing board without having to use the main unit’s cradle. Needless to say, the iron will automatically shut down after a period of inactivity. If you’re keen on trying a steam generator but don’t want to blow a huge wad or put aside a quite large area of storage space, then this pukka pink model is the one for you. This pales in comparison with the Elite Plus and Elite Silence but the older, cheaper Philips steam generator is still a formidable performer. The hefty, 1.8-litre water reservoir pumps out steam at a suitably high-pressure 120 g/min. The iron part of the combo is as light and elegant as the pump is hefty and businesslike, gliding over clothes like an air hockey puck. The button-fired 470g steam boost is enough to flatten most creases. The Philips PerfectCare system involves no temperature controls, flattening everything from silk to denim (not that you should iron jeans, but you get my drift) without having to change the temperature setting. Even more magically, you can leave the iron face down on any fabric – even silk – and, somehow, it will not burn. Add Philips' effective Easy De-Calc Plus lime descaler function and you can be sure this smooth operator will remain gunk-free for years to come. It's quite expensive, but you get what you pay for. And compared to more recent additions to the Philips range, it feels like a steal. This cool copper-coloured model is now the most expensive in the Philips range. It has the same large, detachable, 1.8-litre water reservoir as the Elite, and the same excellent Easy De-Calc Plus lime descaler. However, it continually pumps steam at a higher-pressure 165g/min, then, when you need a bigger blast, a double tap of the button unleashes an industry-leading 600g boost of Icelandic geysir proportions. As with all PerfectCare models, this high-end option uses the company’s ingenious OptimalTEMP technology to control the heat of the soleplate so you can swap from delicates to heavy cotton without having to fiddle with a temperature dial. So remarkable is this system that you can even leave the iron face down on your favourite silk shirt without burning a dirty great hole in it. Needless to say, many other manufacturers are now employing their own single-temp tech in an effort to catch up, but the Philips system remains best. The steam is automatically regulated using Philips’ DynamiQ sensor system, which detects when and how fast the iron is moving and adjusts the steam pressure accordingly. The simplicity alone guarantees this cool, futuristic and supremely efficient model an unequivocal high five. Whether you fancy the high asking price is up to you. The Braun CareStyle 5 steam generator is perfect for medium piles of laundry and delicate clothing though it’s not as attractive or effective as the Philips PerfectCare range – it is somewhat cheaper, mind. This model comes with an iCare mode, which, rather like the Philips models, utilises a smart textile protection system to set the correct temperature for every fabric. And that, in theory, means no more scorched delicates. But maybe the most useful innovation here is the slippery Eloxal-coated 3D BackGlide soleplate, which consists of a smooth, bevelled rear section that allows the iron to hover over fabrics whether its moving forwards or backwards. And that means no more reverse snagging and bunching, especially when ironing lighter garments like blouses and thin, easily-wrinkled T-shirts. This steam generator heats up in a respectable two minutes but comes with a pretty small 1.4-litre reservoir and no cord storage facility. Also, the design of the hand unit is so old-fashioned looking when compared to the super sleek Philips models that you might flinch every time you approach to pick it up. This Tefal model is an excellent workhorse that’ll deal with large quantities of laundry with little fuss. This steam station produces an industry-standard 120g/min of continuous steam and crease-busting boosts of 400g when required. Its small, removable 1.6-litre reservoir provides more than enough steam-generating water for several large piles of laundry while its Durilium Airglide auto-clean soleplate sails over any fabric you throw at it. While this iron doesn’t sport the one-temp tech of the Philips or Braun, it’s still pretty easy to use since it has just three iron settings: delicate, normal and jeans. Even the most inexperienced domestic work-shy should be able to get a handle on that. Descaling is an equally easy, no-mess process. Just remove the scale collector and empty the tiny lime pellets. And when it’s time to pack up, pull on the mains cable and it automatically retracts into its housing. Nice. The hand unit is a bit heavier than it needs to be, perhaps. Otherwise, an excellent choice, especially if you see it on special offer. This is another fantastic, if premium-priced, steam generator from Philips. Again, there are no temperature controls, no way of burning fabrics, easy cleaning and a light (800g), smooth-gliding iron, chained to a 1.8-litre water tank. The pressure is noticeably higher and more effective than the Elite but, as you'd imagine, falls short of the Elite Plus. It more or less lives up to its name. Perhaps not quite 'Silence' but certainly 'Hushed'. This prosumer number sits right in the middle of the Elite and Elite Plus in terms of quality and price, and might well be 'just right' for you, in true Goldilocks style. That's if you're feeling fairly flush, at any rate, as I doubt you'll be able to steal one from a family of bears' house. Astonishingly, this model hasn’t been updated by Rowenta since our original review way back in 2013. Why change a good thing? This writer actually donated his to a London fabric shop about four years ago and it’s still running perfectly, even though it’s been used every single day. It’s even been dropped on a number of occasions and the main reservoir unit has always somehow survived. It’s fair to say that the iron itself isn’t the prettiest model in the pack and it’s quite heavy too. The 1.5-litre reservoir is also an ungainly beast but it delivers a continuous 120g/min head of steam and a not-too-shabby 260g/min steam shot that’s powerful enough to iron the wrinkles out of anything short of corrugated roofing. Standards of ‘silence’ may have been lower five years ago, but the Rowenta is also still quieter than some of the newer models here.